New Delhi: Paying tributes to the framer of the Induan Constitution Dr. B.R. 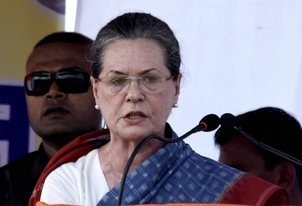 Ambedkar, Congress President Sonia Gandhi today said in Parliament on the opening day of the winter session that the ideals of the Constitution are being challenged and incidents of the past few months are against the Constitution. Giving full credit to Dr. Ambedkar for shaping the Constitution and protecting the rights of the Scheduled castes and Tribes, Ms Gandhi also recalled the role played by Jawaharlal Nehru, Sardar Patel, Dr. Rajendra Prasad and Dr. Abul Kalam Azad and other members of the Constituent Assembly in leaving the Consitution as the most precious legacy for the whole nation.